Nothing is better then the smell of bread coming from your oven. The only bread I have ever made has been banana bread. It is super simple and takes no time at all to prepare. I have yet to tackle making real bread because yeast still scares me. I have a bread machine, as well as a bread machine cookbook so I will have to get over my fear of yeast during the course of this project. My mom and I used to make banana bread a lot together when I was growing up. It was one of the first recipes I learned to make on my own. Mom would make banana bread muffins more often then making the bread which I loved because it seemed like there was more to go around. The muffins would usually be gone within a couple days of her making them because I would eat two at a time. I decided to make a double batch of bread because I had so many bananas that were going bad. So I made one to take to work with me and one to have at home. I will more then likely end up freezing part of the bread so I can enjoy it later. Even though I doubled the recipe, I have shared the single recipe below. Mix together all ingredients, adding bananas and flour last. In a greased loaf pan pour batter. Bake for 1 hour or until the top of the bread springs back. thanks for linking up with foodie friends friday! be sure to come back on sunday to vote for your favorites! I have never tried or made zucchini bread, I want to give it a try, so I will have to hit you up when the time comes! I love banana bread too. Sometimes I really happy when the bananas get overripe it give me an excuse to make it. Yours is a really classic recipe. 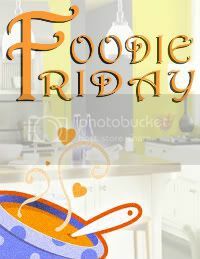 Thanks for sharing it on foodie friday. PS I would move your follow button to the upper right hand corner. I almost missed it. Love the description of your blog... I have multiple cookbooks, multiple cut out recipes and very seldom use them... as I usually only read them and then make my own recipes. I love banana bread though.. Thanks for sharing on Foodie Friends Friday. Remember to come back and vote tomorrow. Newest follower here.